Before the Second World War, Service 412 was operated by Birmingham and Midland Motor Omnibus Company Limited (BMMO—Midland “Red” Motor Services) between Worcester, Crown East and Upper Broadheath. Initially, five return journeys were offered on Mondays to Saturdays, and three return journeys on Sundays, but by 1935 the service had been withdrawn on Mondays to Fridays, and the Sunday service only operated during the summer season. It is likely this services was withdrawn due to fuel rationing at the start of the War and did not return during peace time. The exact dates for this service starting and finishing are unknown, those shown above are an estimate. After the Second World War, Service 412 ran as a Hereford Market Day service on Wednesdays and Saturdays, between Fromes Hill, Castle Frome, Ashperton, and Hereford. Two return journeys were offered on Wednesdays, departing from Hereford Bus Station at 09:00 and 14:00 and the return journey departing from Fromes Hill one hour later. On Saturdays, the service ran at the same times but there was an additional evening return journey departing Hereford at 21:00. By June 1957[Exact Date Needed], this version of Service 412 had been withdrawn and replaced by extending Service 411 (Worcester to Fromes Hill) to run continue past Fromes Hill to Hereford. 1 Certain journeys run direct via Newtown between Shucknall and Fromes Hill. 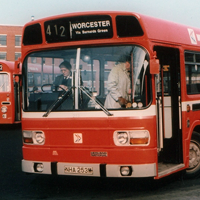 Midland Red Omnibus Company Limited (MROC) introduced new Service 412 on Saturday 2nd October 1976 to replace the Worcester to Malvern Link section of Service 144, which was cut back to run only between Birmingham and Worcester with the closure of Malvern depot. From Malvern Link it then replaced local Malvern Service M13 to Great Malvern, running via Pickersleigh Avenue, Sherrards Green, Pound Bank and Barnards Green. Unlike Service M13, vehicles ran direct along Avenue Road and did not call at Great Malvern Rail Station. In Great Malvern, the service terminated at the Post Office and was then required to run dead along Wells Road to Wells Common to turn round for the return journey. On certain journeys, the vehicle would be used to operate local Malvern area services before returning to Worcester. 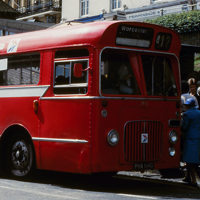 Service 412 was withdrawn on Friday 12th January 1979 and replaced by Service 144, which was once again extended to The Malvern with the introduction of the “Severlink” MAP scheme.